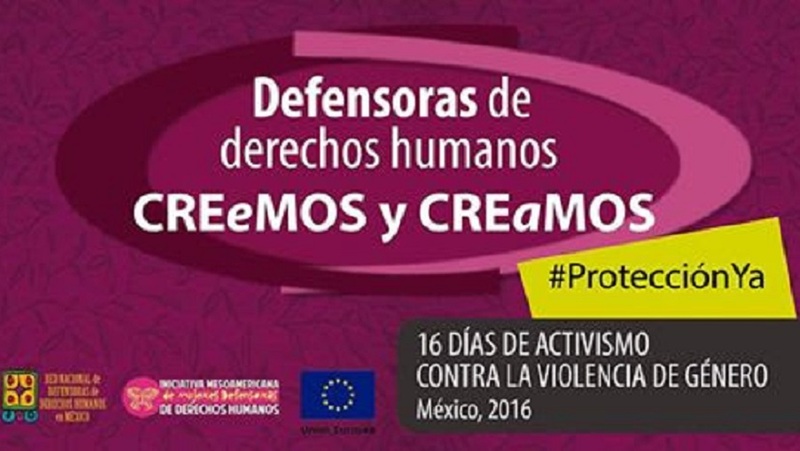 On November 29, the International Day of Women Human Rights Defenders, as part of the 16 Days of Activism against Gender Violence, the National Network of Women Human Rights Defenders in Mexico (RNDDHM) presented the campaign, WE WOMEN HUMAN RIGHTS DEFENDERS BELIEVE AND CREATE. It consists of the circulation from November 25th to December 10th, of a series of printed and electronic materials designed to visibilize the contributions made by women defenders to the society and to their communities in the adverse conditions in which they work. That same day, at 15 points in the country the defenders carried out similar actions to publicize campaign materials, including post cards acknowledging the work of women defenders and posters demanding justice for our slain comrades.